Welcome. This is so going in my Blog! So I'm sat here on a rainy day listening to Bowling For Soup with a lack of motivation to go out training telling myself another rest day will do me good. My view of the 2014 Season started in October where I did a few races and the odd hill climb. I had the view of 2014 was going to be a great season, I had lost my 2nd cat license due to not getting into shape quick enough and loads of frustration in races as I could just keep up but not strong enough to attack! 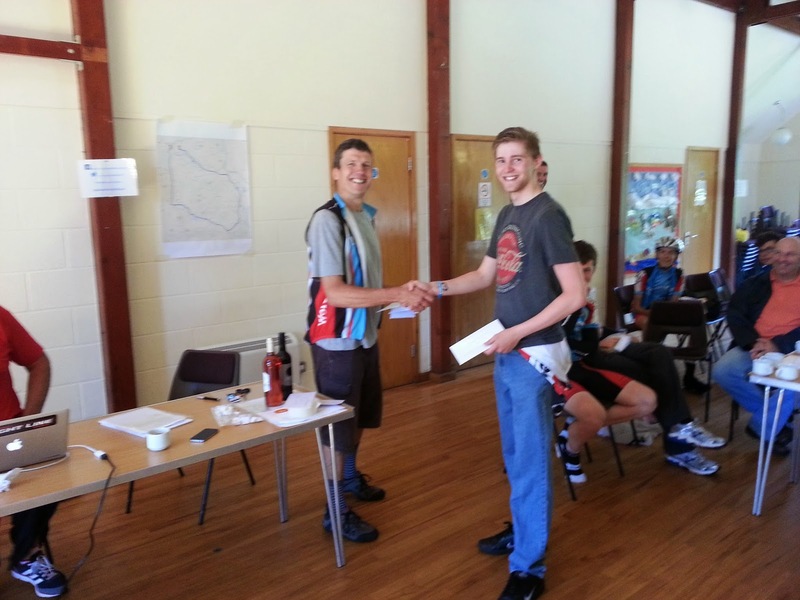 2014 was going to be a good season as a ex 2nd cat in 3rd cat races I thought with a good winter I could clean up and had targets of winning the local road race the Banbury star road race. 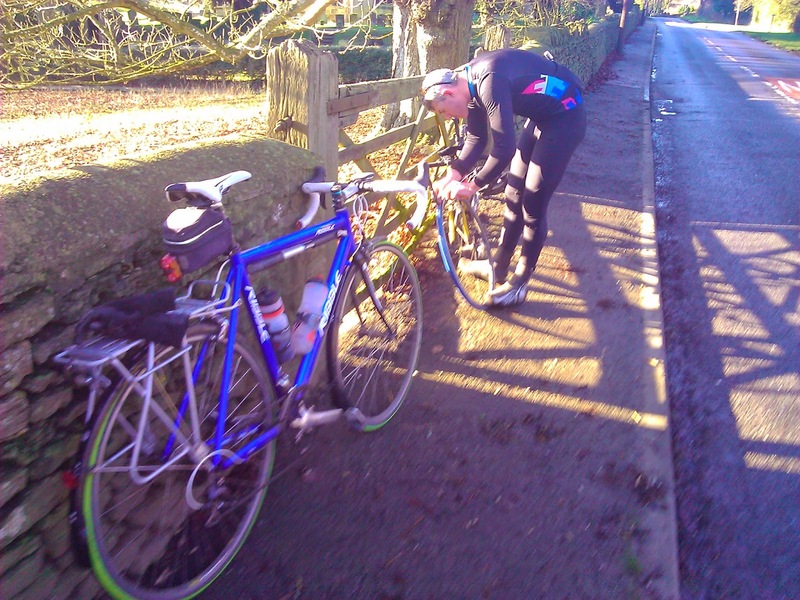 Winter training hazards as Luke had punctured and I helped by taking a photo. So as November hit I had an idea of my FTP around the 240 watts mark, not that impressive but I had ideas of improving it alot. The training was all fitted in around working 45 hour weeks Sundays were always long rides to start with I did the local club run and then some extra solo as I always had when I was in good shape. I then started ride with local riders Luke Souter and Justin Belcher who are both strong riders. We were riding an hours ride to chippy to do a few hours with local pro's some of whom are top hitters racing in the tour series so it was always a fast and hard ride. These rides were so hard that I used to get home completely done in. On one instance I got home so tired and covered in mud I collapsed against the cupboard in the kitchen and just tired to force food down, I also took the photo below. 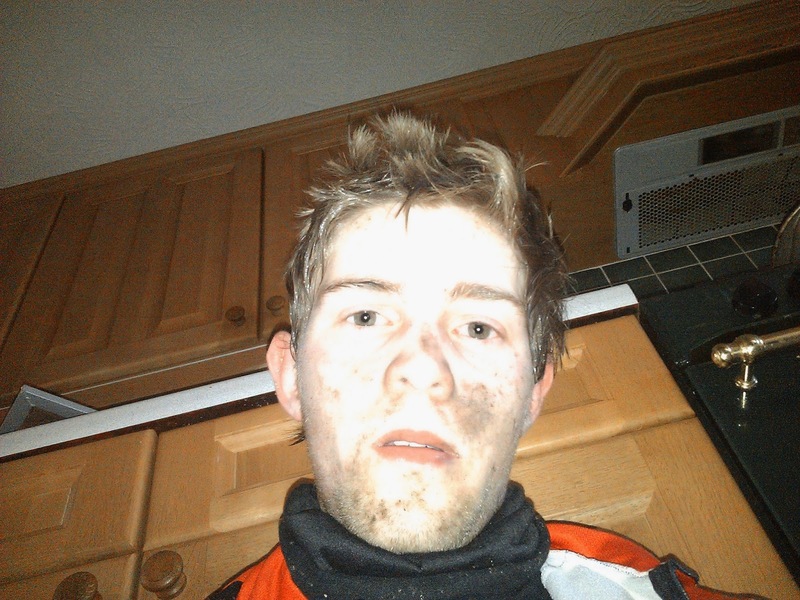 I took this photo after a extremely hard ride one winter training ride of 80 miles. By the time I got to January I was in the best shape I ever had been and the FTP test I hit my target that I was hoping to hit in march which was amazing and fantastic, I was quite surprised! I did a few races out at Stourport on a very good circuit but it was very hard circuit with the wind! Me and Justin did two of these and the day after the 2nd we did the Harp Hilly Hundred an early season Reliability which are always treated like a race. Me, Justin and another local guy Jered Allcock did it with a guy I've raced with alot called Steve Torley who is another strong rider who spent a big chunk of the ride on the front. The reliability was going well and till the 50 something mile I punctured I stopped to fix it and did it in record time of about 3 mins. I chased to try to catch the guys I was riding with but it was too late I was too tired and I just took it easy back to the HQ. About a month later in February I did the Startford Reliability. The story of this starts two weeks earlier. I had a cold so I had a week where I off the bike, just as I was getting over it my clutch went on my car. The following week I did a 6 day week at work and ened up doing 50 hours at work. I also fixed the clutch on my car in that week but did something to my back and ended up with alot of back pain. I had been used to back pain mainly in my lower back from hard racing or training (more on the later). However this pain was different. With a long week of work and no training I was itching to get out on my bike and what better than a reliability out at Stratford. I got up early and cycled the 20 miles there, and on the ride I felt ok and at the 54 mile mark (from home) I had done that quicker than the last time I rode this reliability a few years earlier. But by the time I had done 65 miles I was getting cramp and I got dropped from the group I was with it was ok as I was on local roads but I was in pain Matt Clinton (ex National hill climb champion, fast tester and great guy) hung back for me which I was grateful for but he dropped me on the long drag as the cramp got worst. I got on to the flat to try and get back to HQ I knew if I could then I could get a lift home and sit down in the warm. I hit the next hill. It was horrible I couldn't turn the pedals the pain in my legs was like cramp but when I stopped the was no let up. It took me along time to get to the top. I got down the other side by just freewheeling knowing there was one hill left. It was no good. I stopped, I got off, I tried to walk, This was a flat road that had beaten me and I had cycled along this bit 3 hours earlier. I cracked I rang home for help after only 70 miles. I needed to stop but for someone to pick me up would take a while for them to get out to me. I got back on and cycled abit further but had to stop and sit down. It was no good it still hurt and to get back up was a struggle. I managed to cycle a bit further and as it started to rain I stood under a tree. Knowing my parents where not too bar away I turned around and cycled as slow as I could back down the road and there was the best sight I had seen, my parents car. The following day at work I was still suffering I could just about walk but I couldn't straighten my legs I knew I had over done it and pushed myself too hard, my back pain was back too but I didn't think about that much. That evening once I got home I had tea and them my mum took me to the hospital. The blood test show CK (Creatine Kinase) levels where high like there were when I was last in hospital with Rhabdomyolysis when I was 8. 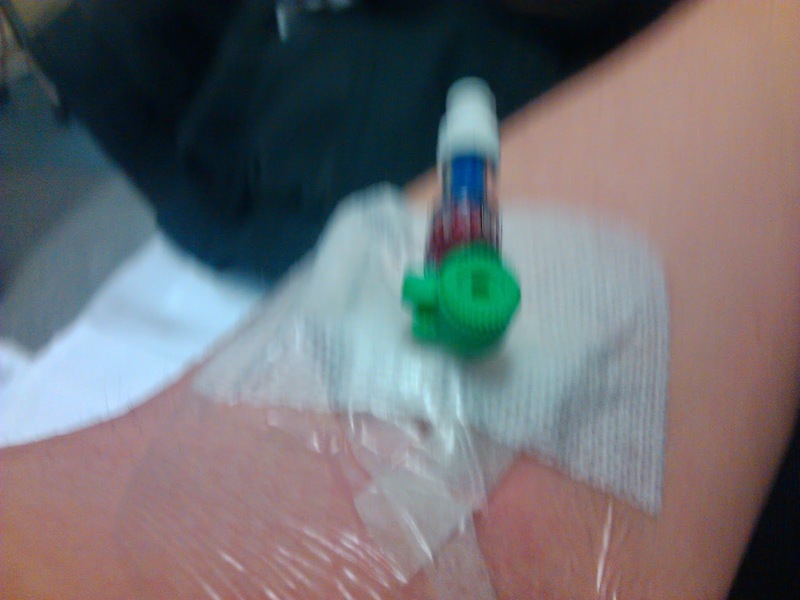 I was put on a glucose drip over night, the following morning I had a blood sugar level test which was low ...That cause one nurse to have abit of panic despite me feeling fine. So after a night in hospital I could only leave the next day (Tuseday) if I could walk to the end of the hall and back. I did, it hurt but I managed it. I was free. The rest of the week was spent at home eating to try and recover. 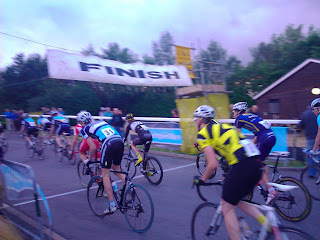 By the Sunday, 5 days out of hospital I then rode Banbury stars reliability which was 62 miles. I took it very easy all the way round riding with old man but I was disappointed with everything that had happened. I rode a few races and tried to train but I lost motivation, mainly with training after work I was still tired and not fully recovered. 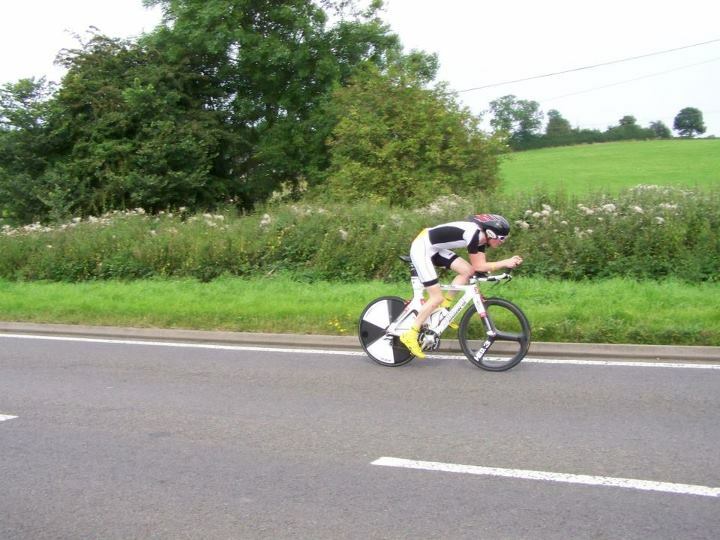 In that time I did the Banbury star Hard riders time trial at 23 miles not too happy with my time. I then did the Spring chicken RR and after my 2nd puncture I was being paced back to the group by the car and then the car stopped for someone else whom had punctured so I was left on my own I gave up shortly after. The following week I did a race at MK bowl, I love racing at the bowl I have always done well there and this time round after a hard race of an hour I got 10th place and a point so I was very happy with that. 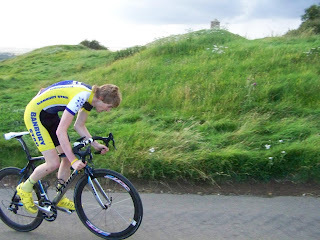 Then the Bill Jinks memorial RR, it was going well I was sat in the bunch I was tired but that wasn't going to stop me. Then as we where going down a hill there was a crash in front of me I had no where to go. I remember see people go down and I remember being on the floor with my hip killing me but I don't remember going over the bars which I'm pretty sure is what happened as i hit someone on the floor. It took me a while to stand up my hip hurt but I got away lightly as one bloke broke his collar bone and another looked like he'd been dazed. The race was called off shortly after that. A few days after I started to feel more and more ruff I had picked up a virus that turned into a chest infection and the week before I was due to go to Spain for a weeks training I was off work hardly able to get out of bed. I was on antibiotics to get over my chest infection. This was my first chest infection and it was horrible I had coughing fits that lasted for a long time and the worst being coughing for about half an hour to the point of being sick and keep coughing covered in sweat. It got to the point of being so ill I though it was going to kill me and this was my 2nd week of being ill, this was a low point. I thought it was never going to end. But after my 2nd lot antibiotics aqnd a few weeks more I was over it finally. But it took a few months to stop coughing. In April I started racing again but my FTP was down to 220ish watts even lower than when I started training in November. Even more disappointment. Now as I write this I'm much happier with how the 2nd half of the season has gone and I've learned alot, I haven't done any road races since the last one I crashed in and not sure if I'm going to go back into road racing, Time trialing seems to suit me more I recover from it alot better and I seem to be less of a sprinter now, not that I ever was. Since I have come back from all the illness I seem to have just gotten better at going my pace, and the last club run I did I kept getting dropped on every hill from people sprinting off yet I can ride at my pace for hours now, which given the choice is how I want to ride. Worcester St Johns Open sporting couse. So far this year the highlights include a 21:36 on a ten mile TT and getting a 3rd place at Worcester St Johns open time trial on a hilly course. I have been doing club time trials in the week and I getting happier and happier with the results every week. So now for me the season is not over yet I'm targeting a few races and going to see where the season takes me. I'm looking forward to the hill climbs at the end of the season, and next year will be better! First post of the year!! So a few weeks ago I went down to Hillingdon to see how I felt and walked away with an 18th place and my seat post alot lower than it should have been. Also I've finally got a new carbon frame, somthing I've been talking about for over a year. Last Sunday I went to the Stratford CC Reliability, with cycling 20 miles out there in the rain we started and I felt a bit sluggish like my legs didn't like turning and after getting dropped me and my mate Justin said lets go home. Solid 60 miles cycling in the rain that day. Today was the Banbury star Reliability ride and using my new bike for the second time we hit the first big descent I overtook the two people in front of me and the bike just flew down that hill. It's the most aggressive handling bike I've ever ridden and maybe on of the fastest road bikes I've ever used. Anyway this gap I managed to keep until mile 45 when I was caught by Justin and then we did a few miles together and he dropped me but after 33 miles of solo breakaway I couldn't get my legs to turn to stay with him on the climb so it was then just a case of get myself back to the finish. I did and managed a time of 3 hours 10 mins over 62 miles and the 2nd fastest time on the day. I am now shattered and just want to sit in the chair for the rest of the day! Thursday was the last Milton Keynes bowl race this year and the race was HARD! The air felt cold and with attacking from the 2nd lap it was hard going, I soon felt tired, my legs were ok but my lungs did not want to take it. My plan was to sit in a try not to hurt to much and after a while two groups went up the road and as we started going out the extra loop it got faster much faster. It was quick going but it was so fast we caught the breaks before the end and I spent most of the second half with a stitch but as we got near the end I felt a bit better and just gave everything in the last lap and managed to get 10th place and pick up 6 points so I'm quite happy with that. Wednesday was the hill climb once again and I felt good, I did a short warm up and I was soon off. I sprinted off not too hard and was feeling good and got quite far up and looked down to see on was on 50 seconds and thought I'm going to have to push harder now. And so I started to kick hard and sprinted up the steep bit at the end and crossed the line in a time of 00:01:17 A new PB by 6 seconds! I was quite happy with that. Last night I raced MK bowl as normal and I felt a little bit tired before the start but I warmed up and felt a bit better. The race started off fast with a lot of attacking and it was soon half way though and we where going out the bottom car parks and no one was away but after more attacking a big group went away, I think maybe 7 people and we soon got to 5 laps to go and everyone was pushing to stay near the front. The last lap was hard and I tired to stay in the right place but was feeling tired and wanted to finish. As we went round the last bend it was not a flat out sprint but it was fast and I felt ok when everyone kicked and I managed to get 9th out of my group I think with 7 people up the road. Tonight was the Banbury star 13 and it had been raining for most the day where I was but luckily I got home and it was drying up. I did a long warm up and got back just with over a min to go. As it was the 2 up I forgot about my start time being earlier, any way I got to the start rest my computer and put my aero helmet on and it was time to start. The time trial started off quick and just after the end of the first road I caught my minute man (my dad) and could see a two up pair ahead and I started to hunt them down! I caught them and then hit a very strong head wind. I got to the last road and the avg speed was still quite high and though the last road I managed to keep the pace high to finish in a time of 29:14 not too far off my PB so not a bad ride I think. Saturday was the Coventry CC open 25 on the hillyish 25 course and it was a bit warm and I started off feeling quite good and managed hunt down someone and pass them then I was soon on the dual carriageway with a good tale wind and felt like I was flying. And then I started to turn round I hit the head wind and it was up hill but I still felt good and kept it going well. As I passed the start Matt Clinton was just starting off and so for a few moments I had overtaken him but I found out after that he started in the small ring. He soon came past me on the downhill bit so I tried to keep him in sight for awhile but in the end he got away. The dual carriageway was fast again and I felt strong for the last few miles where it was slow but I pushed hard though there to get to the line about 2 or 3 bike lengths behind the old man who started out 5 mins in front of me! I also did a PB of 56:48 not bad after my PB less than a week ago!! Last night is was nice and sunny and hot at the bowl and it was out the extra loop right from the start and then round an extra extra loop up a narrow road over the A5 to a tight roundabout and U turn back down. and then a big sweeping U turn back onto the bowl. The first lap was done at a steady pace just to see what it would be like and then the second lap was taken quicker and I think 2nd or 3rd time round I had to go the other side of the cones on the narrow section as I was heading for one, but I managed to get back over and was a little more careful the next time round. As the race went a couple of breaks got away with quite a few people up the road the main group was looking small as quite a few were up the road or off the back and lapping the 3/4 race for the 2nd time was abit easier as it was as we where a small group so getting past a big group worked quite well. The race was hard with alot of sprinting and breaking on the extra bit over the A5 but did make a "nice" change. And as we got to the bell lap we where ahead of the 3/4 and the pace went up and it was fast till upto the line with a hard sprint at the end and I was beaten for a few in the sprint but got 14th so another 2 points to add to the collection. Last night was the 13 once again and it was nice and warm without much wind making it seem like it could be a quick night, I started off near the back about number 33 out of 37 as there was alot of people who turned up. I started off and just pushed a little hard but felt ok and soon got to the next road thinking it would be quicker along there but no it wasn't and the next road was the same, I wasn't catching anyone so just kept pushing hard. On the last road towards the finish I was just starting to lose focus and day dream and all of a sudden Jon Simpkins came flying past me and I tried to keep pace with him but he started to pull the gap out bigger and then he was out of sight as the road twisted and turned. I kept pushing hard and on the sharp bend I got round there very quick as I was pushing hard and then sprinted out and to the down hill bit to then have a rest. The last hill was done flat out as normal and I got over the top and pushed hard to the finish and got to the line feeling abit sick from the effort but in a time of 29:07 8 seconds off my PB so not too bad, in fact I'm quite happy with that. Yesterday was an 25 mile time trial on the best 25 course I've done this year, the reason it's the best is because it is mostly flat. I started off without my heart rate monitor as it broke a few days ago, and now only have speed to go by (old school training/racing?) I started off the TT easier than I normally would and unsure how hard to go but soon settled into the rhythm And could see two riders ahead and so I kept my effort steady and closed the gap passed the first and then the second, and until this point it felt quick as my average speed was near 28 mph then I hit a section of road that felt slow and it was, I thought maybe it was a head wind or maybe the wind had changed direction. Anyway soon after that it started raining very very hard, so hard I could hear it banging quite hard on my aero helmet, I tried to pull my sunglasses down to see over them but the rain was hurting my eyes too much! As I got wetter and wetter I was hoping to get to the turn and try and get and away from the rain. As I neared the turn I could see two people quite close who I thought I could catch, ans so as I went very careful round the roundabout as I know how little grip my rear tire has. I got back upto speed again and passed the next guy and then another and I would not see anyone else again till the finish. The rest of the race was spent trying to get round puddles and trying to kep the pace high. And as I got to the last two roundabout I started to feel happy as it would be over soon. From the last roundabout to the finish I pushed as hard as I could and the I hit the last hill looked to the time and I thought I could do a sub 58 so I sprinted as hard as I could and crossed the line in a time of 57:51 and I was happy with that as it was a PB and in crap weather. Looking at the photo above you would think is was Paris Roubaix (one of my favorite pro races) but it was Milton Keynes bowl again. I forgot to take my Garmin with me and the camera so no pics from tonight. The track was covered in mud and it had been raining throughout the day but warming up it seemed ok for grip. The race started off and everyone took it easy for the first few laps just to see what the grip was like and then attacks started to fire off the front and I went with a few and managed to get away with a few overs but it was a short lived break and pulled back soon. at one point as I was trying to sit in and recover the group started to split and the front group was getting away so as some one attacked of the right I attacked on the left and we each soloed to the front split and it took about a lap and I looked round to see that the last group was going backwards and felt glad I went when I did. We did though and off but as we got to the last few laps it went a bit cat and mouse but we caught the front break within the last 5 laps and as we for the sprint I felt good and was ready and as we hit the hill for the last time the sprint began and I was on the outside and I could see Jake Hales he was a bike length ahead of me and his back wheel just hit the puddle on the left and I saw it sling round like he was going to go down but luckily he held it and I managed to cross the line in 9th place. I was happy with that and I'm now on 62 BC points so it's looking good. After a few weeks of no MK bowl I was back and with two days racing in my legs wanted to see how my legs could do. After the race started it took longer for my legs to get going but I kept in the bunch and after following wheels I found myself out on a breakaway with about 4 other riders, we worked well together doing though and off and we were going well. However when they opened the extra loop the main bunch could look across and see us, as we looked across to see them and they then chased hard. After being brought back I still felt quite good and soon went on another break but it did not last for long. I kept in and wanted to get away as I felt good but no one would let any breaks go until the last few laps. A group got away and I was in the wrong place at the wrong time and was in a group that was a bit far down to get in the points. I got 19th but had fun and felt good, I even found out when I got home that I got KOM at the bowl on Strava!! Tonight was another hot day on the bike and it was also the 13 and my heart rate monitor strap didn't want to work so I had to take it off! The time trial went quite well I was caught by Jon Simpkins for a minute quite soon but I was holding pace with him but as normal on a flatter part he pulled away and once he pulled away he was not seen again by me until the finish! I managed to keep pushing and found the last round to be not quite as fast as normal - possible head wind - but managed to finish in a time of 28:59 and I thought that was a PB until I got home and looked on strava to find I had done a 28:59 last month. Yesterday me and Justin went to Mallory park together and it was nice and sunny for my second time very at Mallory. There was a big line of people wanting to sign on so we knew it would be a good night racing. As Justin and I went to warm up he found the new cleat he fitted would not go into his pedal, he handed his number in and went for a ride and it clipped in so had to go get his number back and just in time to start! On the start line the said 2nd cats go to the back, as it turns out we had a min handicap and someone on the line told us what normally happens and we started and did though and off for about 20 mins to catch the 3/4s and then when we did we eased off and had a rest. As the race went on I got out in a break for about a lap but it soon got caught and then my goal was to go for the sprint, and as the laps counted down we had the bell to tell us it was one lap to go and I was in a good place but got a bit boxed in in the last maybe half a mile and then we hit the hill. It was a flat out sprint and I managed to get out and sprint hard but was a bit too far down to get in the points. I enjoyed the race anyway but the hot days are nice but I'm not used to it! ...Yet. Sunday was the midland 10 champs and I didn't feel great on the day. I warmed up for quite a while in the sun and was soon time to race. I started off and the first 3 miles where into a very strong head wind as well as the road being rolling, and by the time I got to the first roundabout to turn left I had an average speed of 22.7 mph so I knew I had to push hard after that to try and get my average speed up. The road was a quick one even with a cross wind and I was slowly getting to my target average speed, and then it was another left turn at the next roundabout. The dual carriage way to the finish was quick and I managed to keep the pace high to cross the line in a time of 22:40 A bit slower than I would like but I think I was having a bit of an off day and will have to hope for better next year. Last night it was the 10 TT and after good warm up I was off and after the first descent it started raining very hard! I could hear it hitting my helmet and make quite a bit of noise. the rain eased abit and I pushed on and felt quite good, I climbed the first hill ok and got round the first two roundabouts with the roundabout I hate coming up next. I checked over my shoulder and slowed right down and entered the roundabout and tried to slow it a bit but went a bit straight but managed to get round without crashing or any stupid drivers, which was nice. As I returned I felt good a pushed on being sure to go careful round the roundabout. I got though fine and on my way back went over the bridge and a car pulled out infront of me and did not go very fast, so as I got closer and closer to it I moved out and started to over take it. This made think I must have been going well as I had just over taken a car on an up hill slope. I then hit the last hill and big ringed it up there and over the top to then power it to the line, I dug deep and crossed the line in a time of 23:46 for 2nd and 24 seconds of winner Simon Smart. Yesterday was my longest race ever at 75 miles and it was a nice day for it. I started off with arm warmers as it was bit chilly and I did a very short warm up and we soon were lining up ready to start. The neutralized part from the HQ to the course was short but just right to get the legs going and as soon as the flag dropped someone attacked and everyone just kept the pace the same not wanting to go to hard but it then picked up and the racing was on. The first lap was not super fast but people kept trying to get away and I got to see what the course was like and liked the look of the last climb towards the finish, but was unsure how much my legs would like it after 75 miles. As we crossed the line we had 5 full laps to go, with two laps to the first prime. A lot of the time there were people up the road but not too far ahead as no one would let anyone get away, and if one group got pulled back another would get away! I was getting warm so when the pace was low I took the opportunity to take off my arm warmers and had to put them up the back of my jersey out of the way. As we got to the end of the second lap I threw my bottle to the side and just had time to grab my next bidon (first time I've ever done that by the way) and luckily I didn't drop it! The next lap was spent mostly trying to keep fueled up and I drank a lot of water from the bidon I had grabbed over the line. The race carried on with people just of the front never getting too far away and people always attacking and as we crossed the line again I ditched my bottle I got the last time round as it was almost empty and was just extra weight. Then as the pace was up on a rolling part of the course I was about 20 bike lengths off the front and all I could hear was the crashing of man and carbon hitting the road as we were doing about 32 mph. As it turns out my mate Luke Souter was in the crash and came out the worst with a broken collar bone. I never saw him in the race after that (now I knew why) but I thought he was just hiding in the bunch ready to surprise everyone at the end. The last two laps got very hectic as the pace went up with attacks and people pushing the pace on. And as we crossed the line for the last lap 18 people were up the road and it took a while to get anyone to chase but one big guy got to the front and just strung the bunch out and the Justin Belcher did a turn and then so did I, we got the break close and then the bloke who started the chase rode away as no one got on his wheel. one of his team mate attacked and so did I and we got up the drag and then down a fast hill and we got to the front group just in time for them to slow down and then the main bunch came across. The pace was then fast to the finish. As we went down the last hill it was time to fight for a place and as Team Corley were leading out everyone wanted to be behind them and as we hit the hill I sprinted as hard as I could and ended up clipping someone who was going backwards! I lost my speed after this as I tried to keep up right and then had to fight a big gear to keep moving and with the worst cramp ever in my right leg! I crossed the line but could not stand on my right leg! I'm not sure on my placing but I'm glad I got though the race, as it was a 6am start and 3 hours of pain on the bike ...But it was fun. Most of this week I had been ill and not been on the bike much, and watched alot of How I Met Your Mother and Tour De France. As I was feeling almost fine yesterday I went out for a short ride in the morning to try out my new chain ring and found it helped with my knee pain. I warmed up quite well and then did a few laps round the track and then we were on the start line and as we started it was up hill and hard to get clipped in but I luckily got my foot in first time and just had to watch everyone else and the first time down the hill me and a few others near the front got a gap that did open after the first lap but it soo got together and someone went on the attack. the first 20 minutes were very hard as the pace was around 24 mph and we were hitting the hill very quick and its steep with a little dip in the middle just to make it harder. After many laps we got to 5 laps to go and, I did not know this until I looked and saw the 3 lap to go sign and started to feel good and with the one lap to go it started to get aggressive as we went down the hill trying to stay near the front of the group, so I just sat in hoping I could give everything for the final sprint. And as we got round the last bends and hit the hill it was time to sprint as hard as possible for the line and as the group flew up the hill I gave every thing as I pushed round that big gear and I got 7th and I was surprised as at that and very happy!